I was in Santa Barbara with the family for a volleyball tournament my daughter's high school team was competing in. My job, aside from supporting Jackie win or lose, was as one of three drivers carting the group around to and from matches at Santa Barbara High School. The first match was scheduled for 11a, so they planned a leisurely breakfast at Sambos before heading over to the school. With fine SoCal weather on tap (and already having eaten a rich dinner the previous night), I had little interest in over-eating yet again. So after dropping the girls off at Sambos (this place has an interesting history to it), I turned the keys over to my wife who would eventually drive them on to the school. I would spend the next few hours riding around town, visiting a handful of small summits that dot the coastline around the city, finishing up at the high school before the match started. Located just northwest of the harbor, this mesa is named for Thomas Dibblee who had an elegant mansion atop it at the turn of the last century which later became the Leadbetter Estate. Much of the topography has changed since then as the mesa is now the site of the city college's east campus. The Student Services building sits atop what appears to be the highpoint. At least it still maintains some modest prominence underneath all the concrete and asphalt with some views overlooking the city and surrounding mountains. A nearby promontory named Castle Rock that was highly popular with beachgoers back in the day was obliterated during an improvement to Shoreline Drive and the breakwater almost 100yrs ago. The cartographers got this one slightly wrong on the topo map - it should be "La Vigia Hill" where "vigia" is spanish for lookout. Lookout Hill and La Vigia were listed in the old US Coast Guard Pilot, a manual with descriptions of the coast used for maritime navigation. Today the hill is covered in expensive view homes and the Vic Trace Reservoir, the highpoint being somewhere at the end of La Cresta Cir (bulldozing has flattened the top, making it difficult to pinpoint). While not the highest elevation, Duncan BM is the most prominent feature within the city limits of Santa Barbara, sporting 429ft of prominence. It lies at the western boundary where it abuts the Hope Ranch community, an unincorporated area in the county with ultra exclusive homes and ranches. Surprisingly, the highpoint has not yet been fully developed, though multi-million dollar homes are going up all around it. The top is fenced off just north of Centinela Lane, adjacent to a city water services building disguised as a home - the Hope Ranch Pump. Behind this building is a tall monument some three stories tall, with three wishbone-shaped legs forming a tripod of sorts from which a large bell was once suspended. It was built in the 1960s to commemorate the 200th anniversary of the visit by the Portola Expedition and a mass supposedly celebrated by Fr. Juan Crespi at the site. 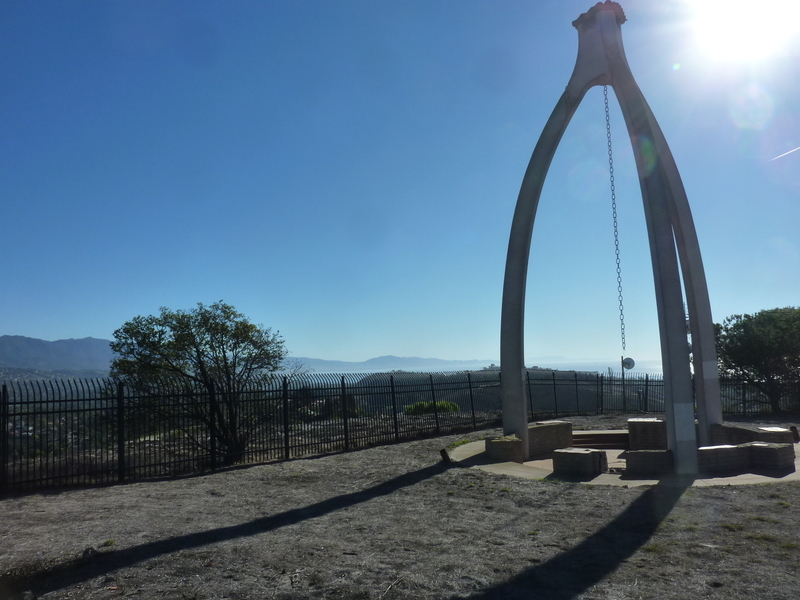 The bell was cut down as a prank by students of San Marcos High School in the early 1970s and is said to be somewhere still in Hope Ranch. The structure was fenced off at a later date and would be mostly forgotten except that it is visible from many points within town - some hate it, some love it, most could not care less. I found a reference mark for the benchmark at one corner of the fence around the tower, but the benchmark itself was nowhere to be found. Before it was fenced and largely developed, the site was popular with the young folk for partying and whatnot - seems possible the benchmark was carted away as another souvenir. West of Hope Ranch is a large undeveloped parcel called More Mesa, separated from Goleta to the north by Atascadero Creek. There is much fine hiking, secluded beachgoing and birdwatching to be found on the mesa. The highpoint of this parcel is at the hilly east side where development of Hope Ranch went unchecked. A large estate sits atop the highpoint at the end of Via Abrigada, though bulldozing rendered the actual point anything but obvious. One has to be content with driving (or in my case, riding) to the turnaround and calling it a day. Turns out I wasn't quite done. Between the first and second matches I had time to ride out to Ortega Hill along the coast between the nearby towns of Montecito and Summerland. I followed the Pacific Coast Bicycle Route along the way, past some rather posh places like the Fess Parker, the Hyatt Santa Barbara, the Biltmore Santa Barbara, Tydes Restaurant and others. The bike path along the beach areas is one of the nicest you can imagine. I parked the bike at the southwest corner of Ortega Hill where a sign indicated a trail leading upwards, figuring this would be better than simply riding to the top via Ortega Hill Rd. The trail, it turns out, simply circumnavigates the hill, the top being occupied by two software companies, QAD Inc and Graphiq, Inc. The highpoint is, or was, somewhere under QADs large buildings. I walked the perimeter of these buildings to check out the views. I have no idea what it's like working for one of these firms, but they have the best outdoor corporate lunch sites with a view to be found anywhere.